FOUR FOR THE BLUES is a live band featuring a stylish variety of high-class music from jazz and bossa nova to soul. The band plays the most favourite compositions and gems of musical history. 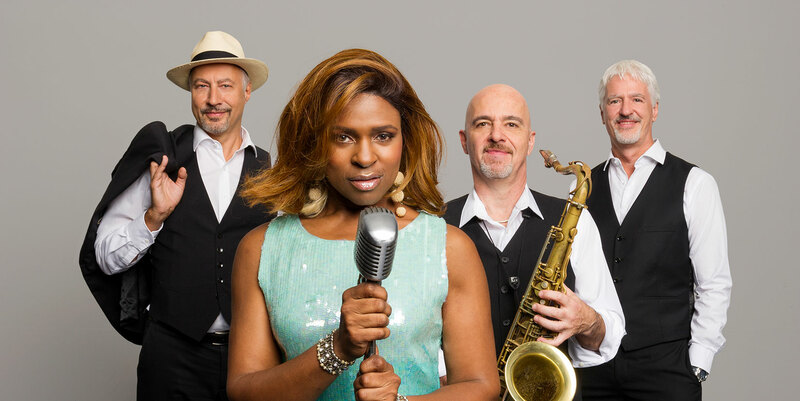 Lead singer Janet Dawkins, originally from London, regularly appeared as solist with Swiss artists Bo Katzman, Pepe Lienhard’s big band and many other international artists. She joins the FOUR FOR THE BLUES quartet with Stefan Stahel or Greg Galli playing the piano, Felix Zindel on drums and Ralph Zöbeli on saxophone and upright bass. The combo offers professional high-class entertainment with a vast repertoire. Its music fits perfectly for private and company events as well as for receptions and dinner events. Simply choose the ideal formation for you personal event. Dive into the world of jazz and swing of Frank Sinatra and Ella Fitzgerald and enjoy the atmospheric soul classics of Aretha Franklin and Amy Winehouse. A pleasure for body and soul!